This weekend Feb. 6 & 7th, we will be at the Home & Remodeling Show in Melbourne Florida. We look forward to meeting you there and discussing what home automation can do for you and your family. 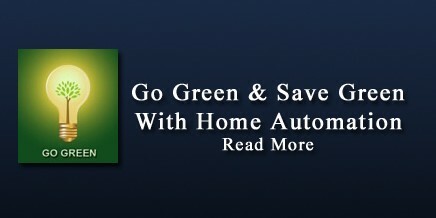 For the occasion, we have produced a new post card explaining what home automation is, and how it can help you both “Be Green” and home as well as “Save Green”. Ever since rumors of an Apple tablet started many months ago, I have dreamed of a day when we could use one as a remote control to run everything in our house. Like most things, there are several degrees of home automation. Today let’s talk about the differences. For most people starting out in home automation, the initial goal is to be able to control a few lights remotely. This can be from a wall switch, a keypad or remote control. This is very simple and easy to do and can be done inexpensively. There are several home automation standards that are capable of this.